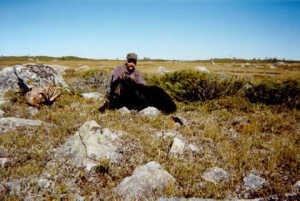 Sou’wester Outfitting offers stand alone bear hunts or the unique opportunity to take a spot and stalk Black Bear in combination with moose and caribou. You know the area is renowned for bear when there is a mountain named Bear Mountain. All Sou’wester hunts take place in Newfoundland’s remote interior where aircraft is the only means of access. The majority of the hunts are spot and stalk in method but stands are utilized on occassion. Many hunters sight and take bear when hunting for moose and caribou. The North American black bear is the most known and widespread of the North American bears. Adult black bears, standing over three feet at the shoulders, have a predominantly black coat that is smooth and short haired. A mixture of genetics and very low hunting pressure make the Newfoundland Black Bear larger than any of its North American cousins. Frequently weighing over 500 lbs, their numbers are estimated at over 10,000 animals. 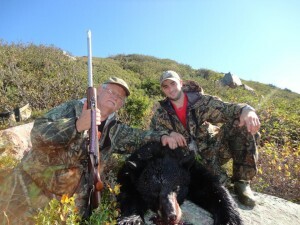 It’s only a matter of time before a Newfoundland Black Bear breaks the existing North American record. These superb predators make for a stimulating hunt for the knowledgeable and experienced hunter. Hunters of Sou’wester Outfitting have the option of having their Black Bear trophies, as well as moose and caribou, prepared by a local taxidermist. Sou’wester Outfitting has had a long time affiliation with Rex Jennings of Jennings Taxidermy Studio. With over 30 years of professional experience and using the highest quality taxidermy methods along with the latest tanning technologies, Jennings Taxidermy Studio delivers on quality workmanship. Offering worldwide shipping, Jennings’ full service taxidermy studio ensures delivery in as short a turnaround as possible. 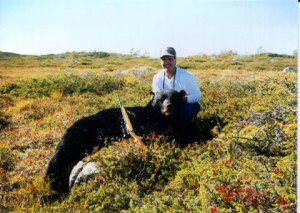 From a bear rug, life size bear or a shoulder mount, clients of Sou’wester Outfitting can rest with the confidence that their Newfoundland hunting trophies are in capable hands. In addition to specializing in Black Bear, Jennings’ Taxidermy also specializes in Eastern Canadian Moose and Woodland Caribou, Newfoundland’s three big game animals.